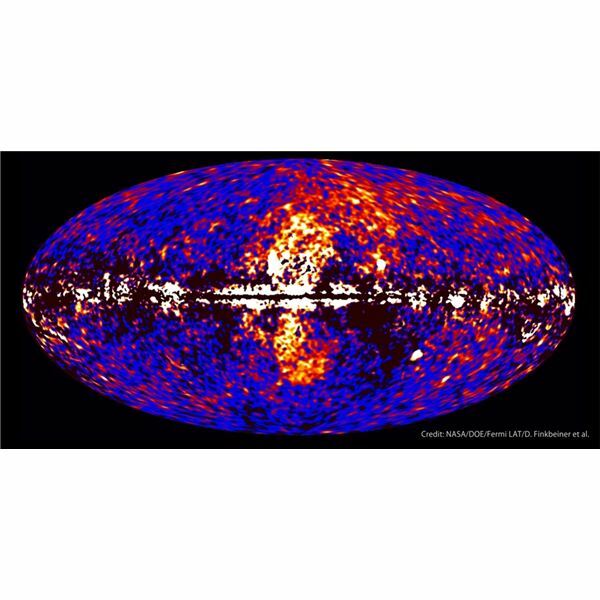 In the past few years, astronomers have been able to see the Universe in a new light—the light of gamma rays, the highest energy part of the electromagnetic spectrum. For some years, astronomers had been flying large balloons to high altitudes with gamma ray detectors to detect gamma ray sources, but it was not until the conquest of space that they were able to put gamma ray telescopes in orbit. The early ones provided some intriguing data, but were not sophisticated enough to let us see the gamma ray Universe. 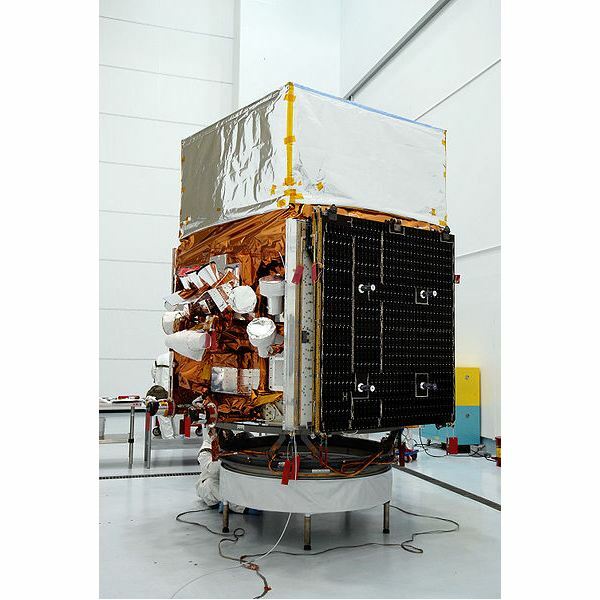 Then in 2008, NASA launched the Fermi Gamma Ray Space Telescope. Almost immediately, it gave us a new and astounding view of the Universe. 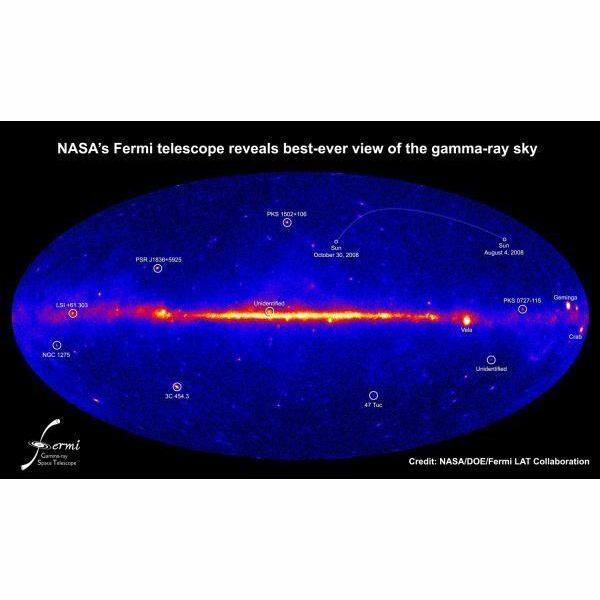 Fermi held two gamma ray telescopes—a Large Area Telescope (LAT) that sweeps the entire sky every three hours, and the Gamma ray Burst Monitor (GBM). The GBM can see the entire sky, and detects sudden bursts of gamma rays from supernovas, active galaxies, pulsars and other cosmic wonders. The two instruments began working overtime as soon as they were activated. As the LAT scanned the cosmos, it quickly found a universe filled with active galaxies—galaxies that emit huge jets of radiation from their cores. Most of this is gamma ray radiation and so had not been seen before. 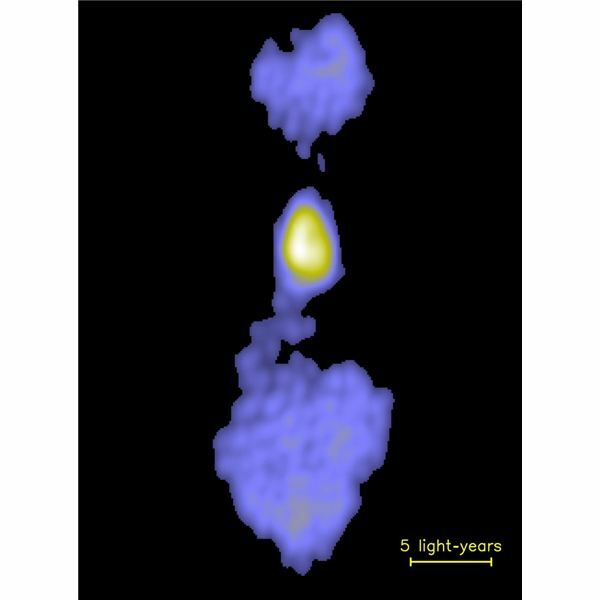 Astronomers had identified three types of active galaxies—Seyferts, Quasars and Blazars. Seyferts emit low energy gamma rays up to about 100 kilo electron Volts (keV)—one eV is the energy gained by an electron accelerated through a potential of one volt. Quasars are extremely bright galaxies very far away—perhaps 12 billion lys distant or more. They also emit copious levels of gamma rays, 100 MeV and more, some up to several TeV. Blazers are the gamma ray champs however, matching and exceeding Quasars. They are closer, but exhibit some strange behavior. 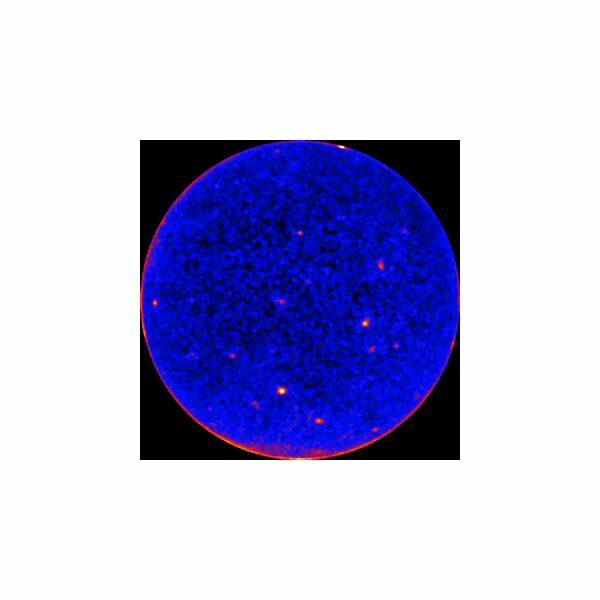 Both in gamma ray emission and in visible light, they are variable, their emissions varying over days or weeks. Astronomers have not been able to explain this phenomenon yet. All three types of active galaxies are thought to be the same. It just depends on how we are looking at them. If the jet is pointed directly at the Earth, we see an intense high energy beam. 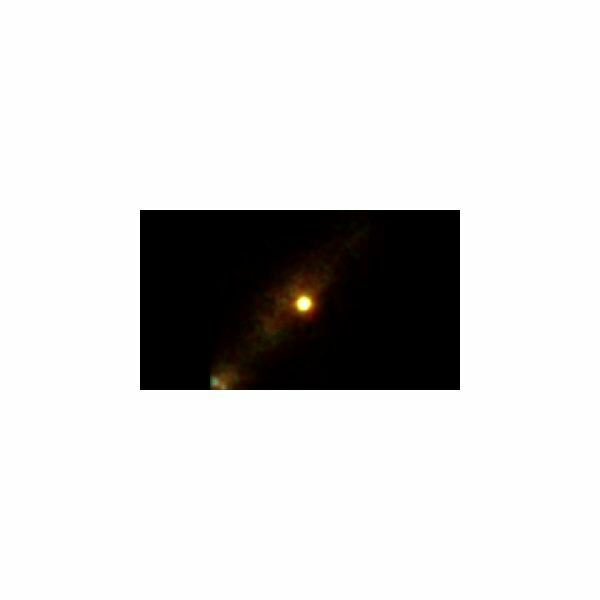 If we are looking at the beam from the side, we see only a low intensity source—a Seyfert. Even our own Milky Way seems to be putting on a show of its own. At least it did 25,000 years ago. 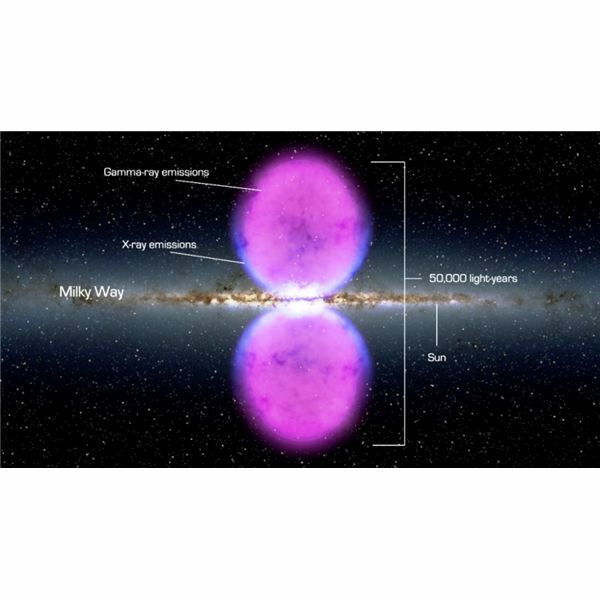 At the galactic core, 25,000 lys away, Fermi imaged gamma ray bubbles ballooning out into intergalactic space above and below the galactic center. These bubbles extend out 25,000 lys on each side of the galaxy. It is theorized they are the result of the massive black hole at the core swallowing up stars, or of several black holes merging. 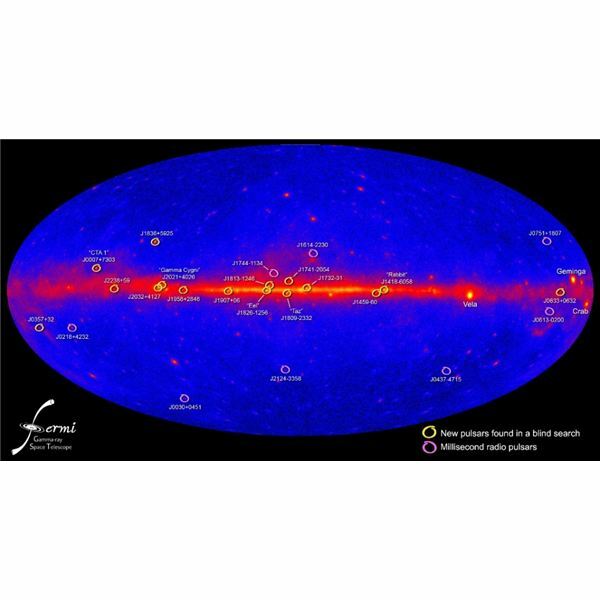 Throughout the Milky Way, Fermi has found 12 gamma ray only pulsars and 18 that emit gamma rays. The ‘brightest’ of these is the pulsar Vela, a remnant of a supernova. The explosion gave this pulsar a kick that has propelled it on a trek through the remnants of the exploded star at a million miles an hour. Its speed through the dust and gas produces a bow shock wave, as shown below. Fermi has found that even Mother Earth emits gamma rays! Shuttle astronauts previously had photographed plasma jets being ejected into space from the tops of thunderstorms. The GBM detected gamma rays being emitted. 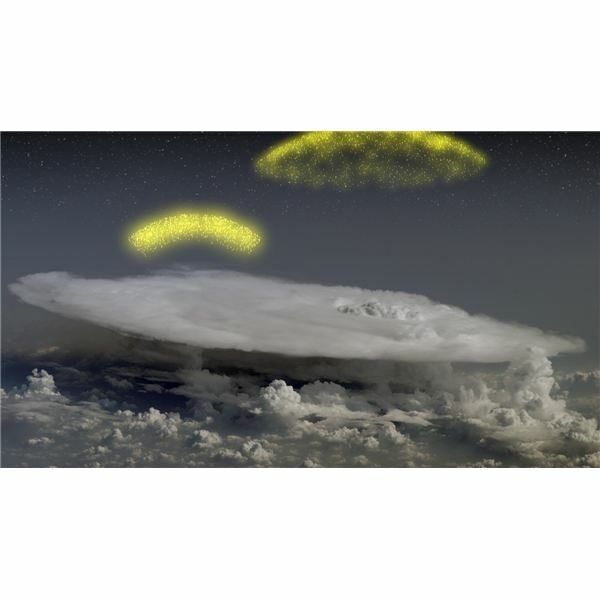 But even stranger than that, Fermi detected the thunderstorms hurling something else into space with the gamma rays. They were sending antimatter into space! It seems the electric fields that produce lightning in thunderstorms create an intense field at the top of the storm. The field becomes so strong it drives a deluge of electrons upwards toward space at almost the speed of light. As the electrons hit air molecules they create gamma rays. The gamma rays transform into a particle pair—an electron and a positron, an anti-electron.